This is one of the largest known Sumerian heads. 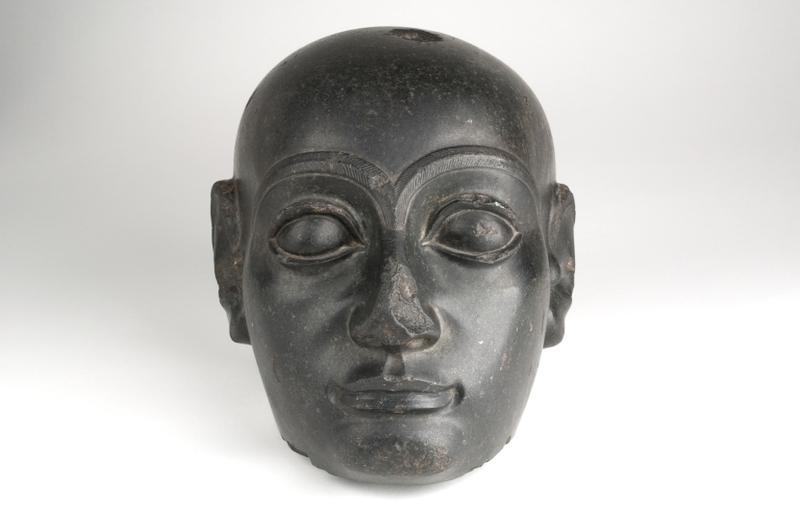 It is quite similar to portraits of Gudea, the most famous and intelligent ruler of Lagasch. There is very little information about the origins of this piece, which Mexican collector Marius de Zayas donated to the Museo del Prado during World War II. Zayas himself stated that "the pieces that make up my donation have been collected over the course of twenty years and they all come from importers of Oriental art. As a result, I could not obtain exact data about their provenance, or where they were excavated" (Text drawn from Schröeder, S. F.: "Marius de Zayas, el donante reencontrado", Boletín del Museo del Prado, 40, 2004, p. 85). Height: 22 cm. ; Width: 26 cm. ; Base/bottom: 21 cm. ; Weight: 18.6 Kg. Museo Nacional del Prado, Catálogo de la escultura, Madrid, 1957, pp. nº435-E.
Johansen, Flemming, Statues of Gudea ancient and modern, Akademisk Forlag, Copenhagen, 1978, pp. 40. Museo Nacional del Prado, Catálogo de la escultura, Patronato Nacional de Museos, Madrid, 1981, pp. nº435. Espinós, Adela; Orihuela, Mercedes y Royo Villanova, Mercedes, El ''Prado disperso''. Cuadros depositados en Madrid. X. M.N. Artes Decorativas, Boletín del Museo del Prado, 4, 1983, pp. 62. Schröder, Stephan F., Marius de Zayas, el donante reencontrado, Boletín del Museo del Prado, 22, 2004, pp. 83 / lám. 4.